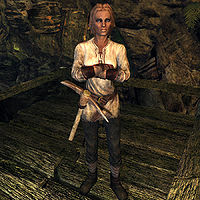 Annekke Crag-Jumper is a Nord ranger and former adventurer who lives in Darkwater Crossing with her husband Verner Rock-Chucker. The couple has put their exploration days behind them, but while Verner is seemingly happy with the more relaxed lifestyle, Annekke has a hard time settling down and will ask you to do some adventuring for her during the related quest. She claims to be the one who discovered Goldenrock Mine, a likely claim since her house is the only building in town. She sleeps in the house every night between midnight and 6am and always starts the day with a one-hour meal, followed by yet another hour in bed. At 8am she ventures outside and spends three hours wandering restlessly around town until her workday in the mine begins at 11am. After five hours of mining, she leaves the mine at 4pm. She then spends the rest of the day wandering around town interrupted only by a one-hour dinner at 6pm. Anneke wears a set of miner's clothes with boots and a pair of gloves. She carries an iron dagger, a pickaxe, a hunting bow with twelve iron arrows, and a selection of common items and gold. When you approach her she will get nostalgic, saying: "A traveler? I'll be [sic] you've seen some sights. We should swap tales sometime." She will then start showcasing her knowledge of the surrounding area, starting with the Eldergleam Sanctuary: "There's a gorgeous tree that grows right up through a cave to the northeast of here." She will also provide a bit of advice: "If you're heading to Kynesgrove, stick to the road. Some pretty dangerous caves between here and there." She will then start to nag about her comfortable husband: "Verner used to love exploring before we got married. Now he's become a bit of a milk drinker. Likes to stay home." Her last recommendation is: "If you head straight west from where the White River splits towards Whiterun, you can get a look at the Cradlecrush giants." Her husband, Verner, has different interests than his wife and will say: "Annekke used to help more with the mining, but nowadays she's a bit of a bounder. ", "I do love my wife. Just wish she'd get her head out of the clouds. ", "If you want some information about the area, Annekke knows it better than anyone." and "Sometimes I feel like Annekke cares more about finding new rocks than being with me." "You used to love finding new places." Annekke: "Verner, you should have come out with me yesterday. I found the most amazing tree growing right out of a cave." Verner: "And I found a new deposit of amber. Would have been nice to have some help pulling it out." Annekke: "You used to love finding new places." Verner: "I still do. I just like to have food waiting for me when I come home." Verner: "Ever think about spending more time around town?" Annekke: "Not when there's so much to see!" Verner: "I guess I should join you more often." Annekke: "You should. I miss you." Verner: "Sweetheart, did you move my pickaxe?" Annekke: "It's at the south end near that loose rockpile." Verner: "So you can be helpful sometimes." Annekke: "No need to get snippy." When asked if she used to be an adventurer, Annekke will immediately start to tell stories: "That's right. Used to explore all over. I'm the one who originally found the mine Darkwater Crossing was built around. I was actually scouting a bit the other day, old times sake. Spied a brigand heading back to his camp. Up for a little hunting? My husband is being a sad stick, so I can't go myself." When you accept her offer she will start the quest by saying: "This brings back memories. Come back when you're done and maybe I'll be up to showing you a few tricks." When exiting conversation she will remind you: "Bandits are cowards. Don't strain yourself chasing them all down." When you return to her after killing the bandit leader, Annekke will be impressed: "You remind me of myself a few years ago. Let me show you a little bit about wearing light armor. It's helped me out whenever I was scouting." She will then raise your Light Armor skill by one point and add: "Now I've got the itch to travel again. If you're leaving town, I wouldn't mind coming with for a while." After that, she is available as a follower. Although you can't marry Annekke, you can marry her daughter, Sylgja—which can make her your follower and mother-in-law. Although listed as a Ranger class, unlike Faendal and Jenassa she cannot dual wield most weapons properly. She will dual wield Forsworn weapons. Also, she can do so if you give her a pickaxe, just like Derkeethus, and will use the pickaxe as an offhand weapon. As with all radiant quests that have multiple quest-givers, you can only have one of them active at a time. If you want to start Annekke's quest and you already have another version of Kill the Bandit Leader active, you need to complete it before you can start this one. It appears that she may attack without provocation either when in the mine or out. This can be resolved by leaving, waiting, and then returning at a later date. Another way to solve this is to get a bounty in Eastmarch and pay it off. Her radiant quest may conflict with a Thieves Guild quest depending on the radiant options. Annekke may not give her radiant quest, ever, even if you have no other active quests that could possibly conflict with it. 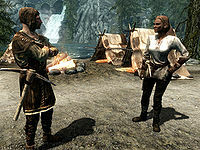 The other three NPCs (Ahtar, Brunwulf Free-Winter or Fanari Strong-VoiceDB) that can give a version of the radiant quest appear unaffected, even while Annekke is glitched. This makes it impossible to acquire Annekke as a follower, and she will only give ambient dialogue instead of entering into a conversation tree. This page was last modified on 5 January 2017, at 18:51.